Sometimes, we get so focused on dental and periodontal diseases, defects or what to do when your body starts doing things wrong that it’s easy to forget just how interesting – and downright amazing – our bodies can be when they’re working correctly. Today we’re going to take some time and explore some facts that make you, and your teeth and gums, incredible. Your teeth start to form in utero: As the fetus develops, the baby teeth are developing as well. Most children don’t have their first teeth emerge until 6-12 months of age, but for whatever reason, some babies are born with teeth already emerged. Your teeth make you unique: Just like a fingerprint, your bite is unique to just you. No two people have the same set of teeth. This is why dental records and bite marks can often be used to identify people. What you see is just “the tip of the iceberg”: The teeth you see when you smile are only part of the story. A full third of your tooth is hidden in the gums. Hard Parts: Bone is about as strong as granite – but the enamel on your teeth is even stronger. In fact, it’s the hardest part of your entire body. You only get two – usually: Most people only get two sets of teeth, your baby teeth and your adult, or permanent, teeth. We aren’t built like sharks, who replace their teeth constantly. That’s why we stress the importance of proper care and maintenance of your teeth and gums. However, in some rare cases, some people end up making extra teeth. This is called hyperdontia and effects be1% – 4% of people, more commonly males than females. Normally, it’s just one or two teeth, but in extreme cases, a person may have several extras. Typically these teeth are pulled since your mouth just doesn’t have room for them and they can cause discomfort and difficulty eating. You make a lot of saliva: Throughout a persons life, they create enough saliva to be able to fill about two swimming pools. It may sound gross, but saliva is very useful. It protects your teeth from the bacteria that naturally live in your mouth, it helps food go down more easily, and it aids in digestion. Sugar isn’t the only super villain: Although we tend to think of sugar as the reason for cavities, it’s not the only thing that can cause tooth and gum decay. Foods with low pH values can do just as much damage. Acidic fruits, sour candies, soft drinks, fruit juices – even gummy vitamins – can begin to eat away at the enamel of your tooth. Your mouth may be an indicator of overall health: Diseases like heart disease, osteoporosis and diabetes have all been linked to the health of your teeth and gums. Enamel hardens with time: When teeth first erupt, the enamel is immature and tends to be softer and more easily damaged. It cures over time, though, fully hardening about ten years after the tooth erupts. 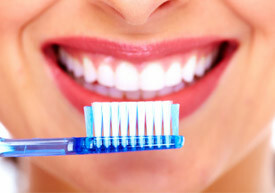 You spend a long time brushing: On average, a person will spend about 40 days of their lives brushing their teeth.